We have a new Kids Game at our house that we LOOOOVE to play! Aunt Kasey taught it to the kids and we’ve been playing it ever since. It’s fun to watch Ty and Avery, 6 and 4, playing it and having fun during quiet time! 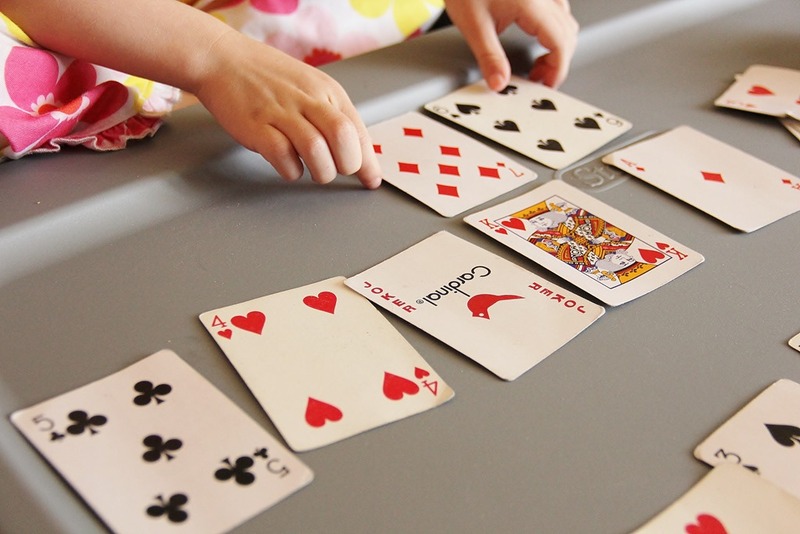 This game is great to teach them counting, as the cards are placed in numerical order each round!!!! Avery and I were both not feeling well one weekend, so we played while we rested, and she totally kicked my booty! It reminded me I wanted to teach it to you! 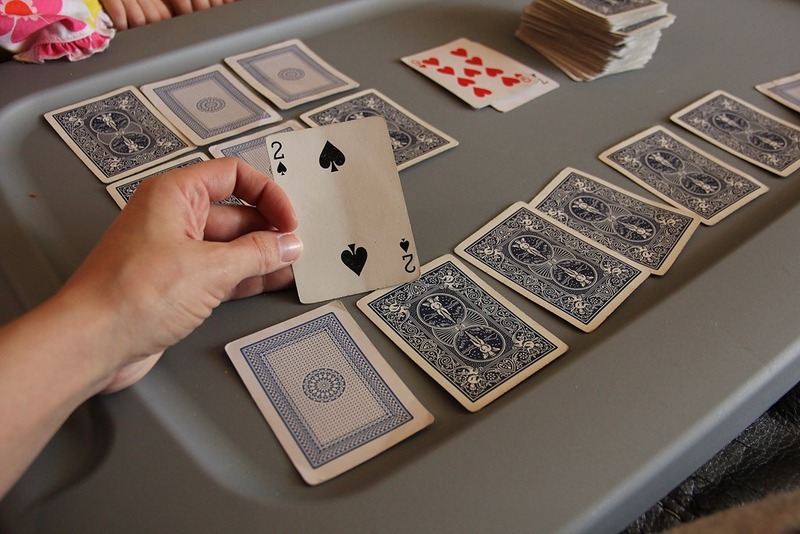 Shuffle, then deal each player 10 cards face down, no looking! The remaining deck is placed in the middle. 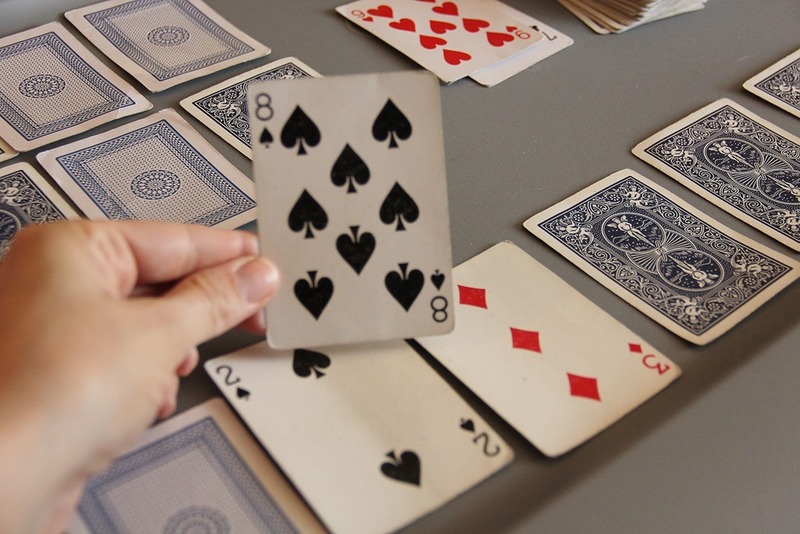 The point of the game is to line up your cards from Ace through 10 before you opponents do. The first player draws a card from the center deck. If it’s an Ace through a 10, place that card in its correct location. For all remaining turns, each player chooses from the deck or the discard pile. 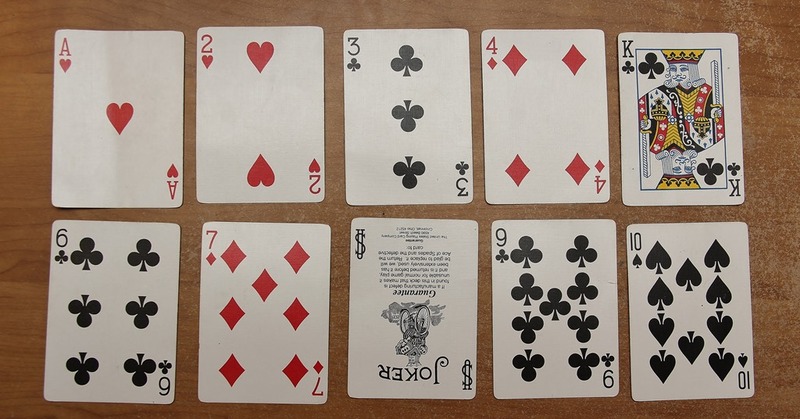 Example: In this photo, I drew a 2, so I am flipping up the card in the 2 position…..
Wild Cards, King & Joker, may be played anywhere in your hand at any time. You keep flipping cards like this until you get a number you cannot use, then discard and your turn is over. Example: Under the 3 position was an 8 I didn’t need because it was already filled with a flipped 8, so I discarded it and my turn was over. Avery could choose to grab the 8 from the discard pile, OR draw a fresh card from the stack. If you draw a card that can replace one of your Wild Cards, do so and use the Wild Card again in another spot! Example: Here I drew a 5 from the draw pile It can replace my Wild Card King, and he will go down on 8’s position. Because of this, I will have finished this round successfully. 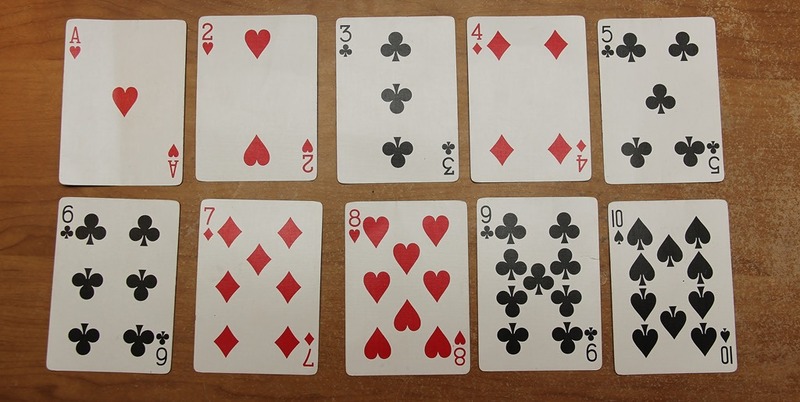 When a player has assembled all cards Ace through 10 in front of him, he wins that Round. Remember, Wilds are Joker and King! 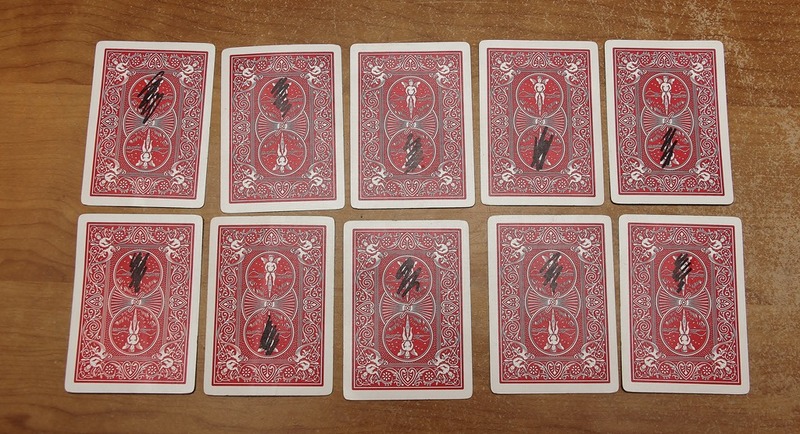 After the Round winner flips his last card, each player has ONE last chance to draw a card and use it. They may also flip over all remaining cards, per the chance that they actually can use those cards and finish their Ace-10, Wild cards and all. The deck is reshuffled and dealt again, only now, ALL of the previous round winners who completed Ace through 10, only get NINE cards. They will spend the next round assembling Ace through Nine. If you didn’t win the round, you once again have to try to do Ace through 10 until you complete it. 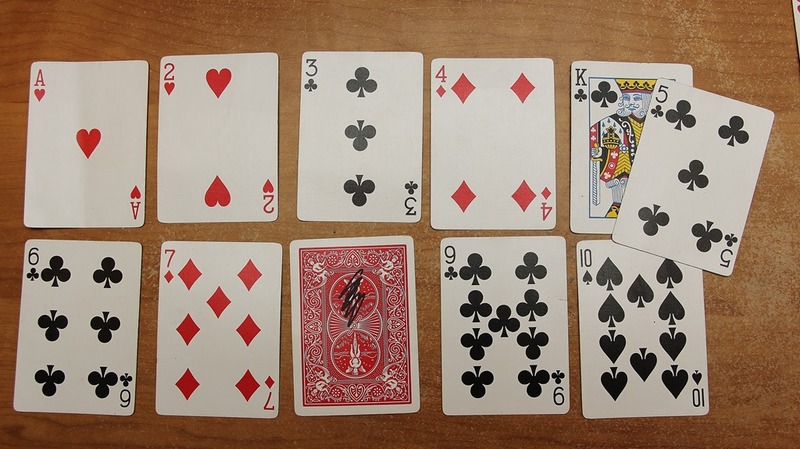 This continues Ace-8, Ace-7, Ace-6 on and on, until one player gets down to one card in front of him and draws an Ace. That player wins the entire game! Have fun, it’s such a great game to play with your kids! 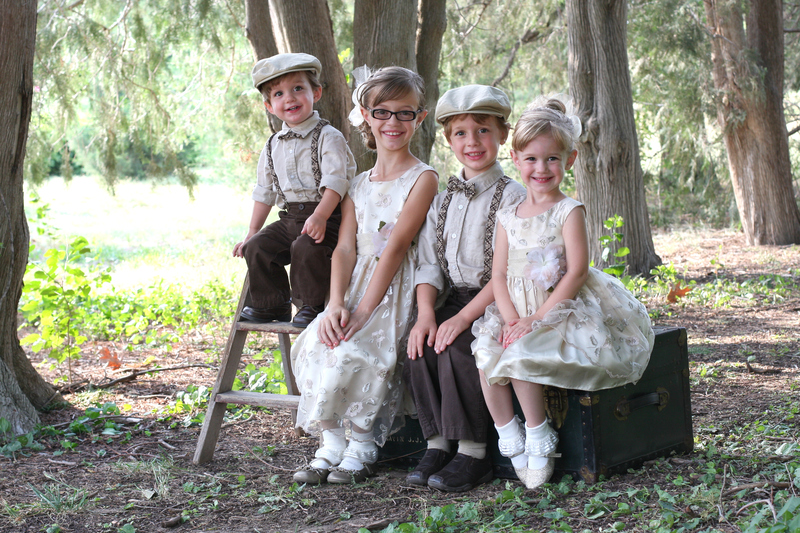 And such a nice change from Candyland or Shoots & Ladders…. WOW! That sounds like a cool game…even kids can figure it out. Thanks so much for sharing. Gonna have to try it soon. What about the jacks and queens? Also, do you keep going if you place a card in the right place? Could you have taken your 8 and put it in the 8 place? 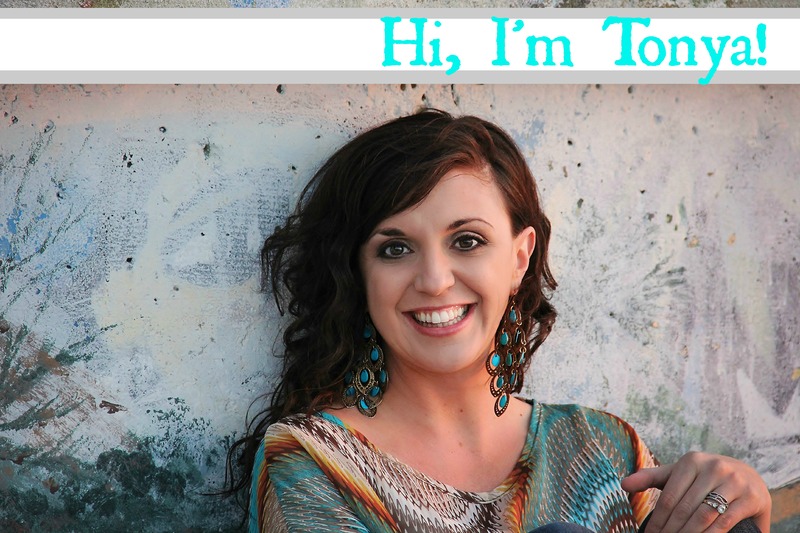 sorry – sounds like a fun game and just curious! 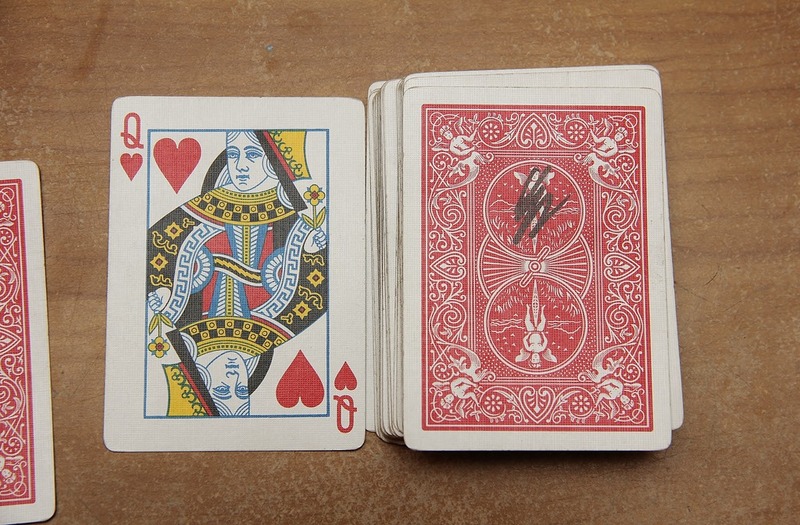 Jacks and Queens are nothing, you just discard and your turn is over. I already had the 8 filled with an 8, so it was a discard. Ohh I bet the grandkids would like this game too! Sounds like a fun little game. My kids would enjoy to play this. Thank you for telling us how to play this wonderful game! Sounds like a fun game. 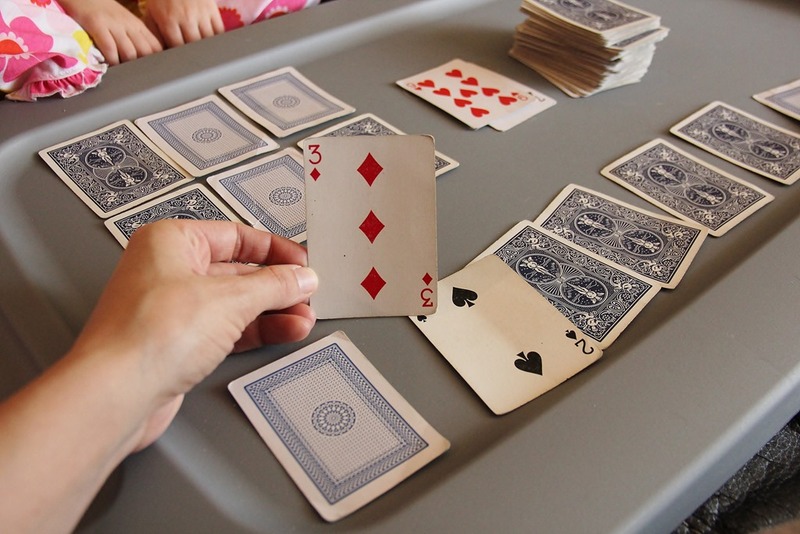 I love card games and this looks like one most of my kids can play. We will be trying it out this summer. I like card Games it’s Really interesting Thanks for sharing ! You must say trash when you end your turn. 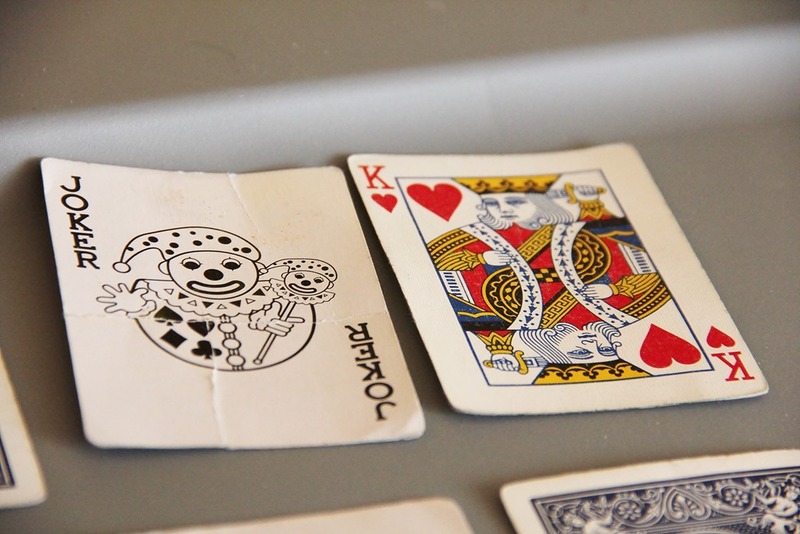 I’ve been playing this game since I was a little girl ..and I JUST learned it was a real game .lol except we never used the kings and jokers …if you get one you get skipped. Thank you, my son was tought this game with some “house rules” that made it unfair. Basically stealing cards from the other player and putting the discards on the bottom so the next player could not have them. Now we know how to play and can have fun together. My son is a game freak and was asking to play a game tonight. I came across this blog and we played this instead of his other choice. We have just learned about this game and were told that J, Q and K were garbage there are no wilds. But it is fun either way. Educationally, I would think it would make sense to do it that way so that the child can associate the number place with the number card. We were not told anything about stealing from another player as another commenter stated and I agree with them that would make the game less fun. I like that it can be played with more than two players. Thanks for posting it. Thank you !!!!!!!!!!!!!!!!!!!! Now I can tell my little sister that she was wrong and i was right! I love this game! It is really fun! I was playing with my son, and had a wild card on the 4. I pulled a 4 from the deck and use the wild card for the ace. As I picked up the card in the ace section, I noticed my pick up card WAS an ace. Could I have swapped the wild card, again, and put the ace back down. It was still my turn and it was a card I could use!!! My son and I are not agreeing on this. He says that I have to put the card in the pile because I can only was one slot at a time. What is the proper way? You can keep going!!!!! Like if I put a 2 in the 2 spot, and flip up a 6. I can use my 6 in the 6 slot and can keep going UNTIL I get a jack or a queen….or a number I ALREADY have comes up! Hope this helps settle the dispute…. It was very useful cause I was teaching my fam! A few years ago, my daughters taught me this game, so I made an app out of it. Fun on the go! Last card like 10 spot? Or last card like 1 spot? Thank you! It was great to see you again!!! I am a kindergarten teacher. My students LOVE this game. We call it garbage-but its the same thing. It is great for teaching subatizing and putting numbers into a tens frame. They even want to play it during playtime. I am going to send home a deck of cards and the directions as their end of year gift. This helped our family resolve a small dispute. 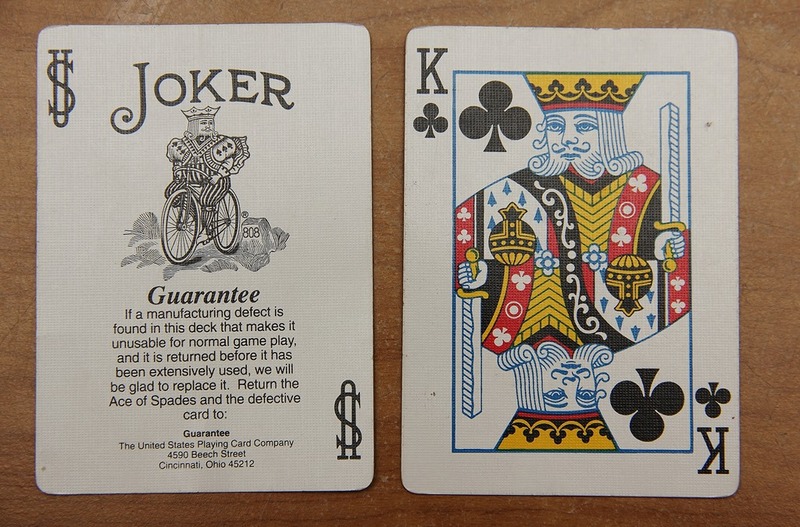 We use only the Jacks as wild cards, rather than Jokers and Kings which works since we are used to throwing away the jokers right away.